I’m sure it will come as no great surprise to you that the poinsettia is December’s birth flower. As we move further into the month of December, you’re likely to see poinsettias appearing in the windows of homes, in department store displays, and in office buildings, along with dozens of other places. These cheerful plants are a permanent part of the Christmas season. I wanted to learn a little more about this familiar flowering plant, so this week’s post is all about the perfectly popular poinsettia. Enjoy! The history of the poinsettia goes back centuries. In the 14th century, the Aztec people used the leaves of the poinsettia to dye clothing and make medicines to cure fever. Poinsettias were a symbol of purity and used in religious ceremonies in many churches. In 1828, a botanist named Dr. Joel Poinsett found a shrub with colorful leaves growing in Taxco, Mexico. He sent a sample back to his home in the United States, where the plant would become known as the poinsettia. This plant goes hand in hand with the Christmas season. Its connection with Christmas goes back to the story of a Mexican girl named Pepita and a gift she gave on a Christmas Eve long ago. Today, more than 34 million poinsettias are sold each year in the United States! 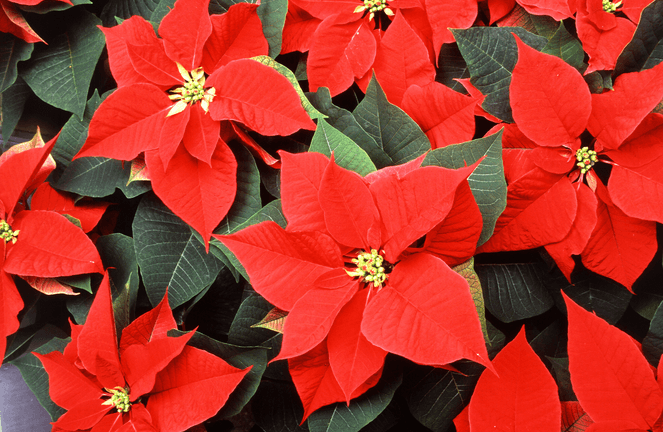 You may be surprised to learn that there are more than 100 varieties of poinsettia. Poinsettia colors include pink, white, salmon, apricot, cream, and yellow, but red is the most popular color when it comes to these appealing plants. 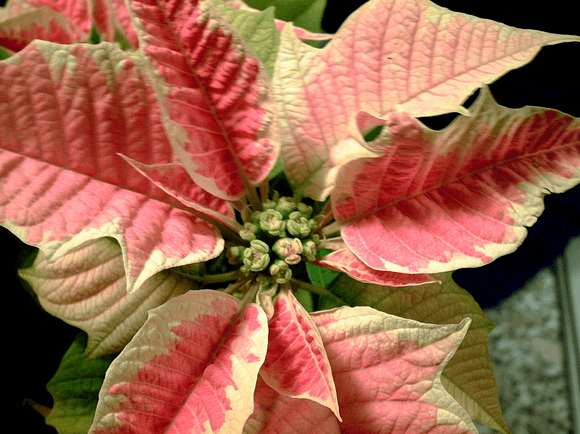 There are also varieties of poinsettia that feature speckles or bi-colored leaves. If you happen to see a blue poinsettia, you should know that its leaves have been treated with a special dye. Each December, I choose several poinsettias in different colors. I like to place one in each room in my house. It’s a simple way to spread color and joy throughout my home. A poinsettia that is blooming needs indirect sunlight to flourish. Also, put your plant in a room that’s about 60 to 70 degrees most of the time. Be sure to avoid putting your plant near a window or door where it could be susceptible to drafts. When a poinsettia is not blooming, it requires a reasonable amount of water about two to three times per week. However, if the plant is blooming, you can lessen the amount of water you give it. The leaves of a poinsettia can attract dust or dirt, so it’s a good idea to give it a light mist with a spray bottle every few days. If you take special care of your poinsettia, you can get it to bloom more than once! The red parts of a poinsettia are its leaves, not its flowers. The flowers found on a poinsettia are tiny and yellow. In a tropical climate, a poinsettia can grow to a height of 12 feet. This makes it a tropical tree. December 12th is known as National Poinsettia Day! California is the top grower of poinsettias. The shape of a poinsettia is sometimes compared with the star of Bethlehem. I hope you add a few poinsettia plants to your home this December!